The Sainsbury Institute for the Study of Japanese Arts and Cultures (SISJAC) located in Norwich, a suburb of London, UK launched the “Shaping the Fundamentals of Research on Japanese Arts” project in July 2013 jointly with the National Research Institute for Cultural Properties, Tokyo. Under this project, in Europe and the United States, exhibitions of Japanese art have been held and English-written information about Japanese art in the form of books and literatures have been collected. (Information on these literatures can be retrieved at the “References on Cultural Properties” of the “TOBUNKEN Research Collections” website of the Institute: http://www.tobunken.go.jp/archives/). With the objective of confirming the progress of this project during this fiscal year and its continuation for the next fiscal year and beyond, Atsushi TANAKA, Deputy Director General, and Tetsuei TSUDA, Head of the Archives Section of Department of Art Research, Archives and Information Systems, visited the SISJAC from 16th to 21st February and had discussions with Mami MIZUTORI, Executive Director of SISJAC, and the data input staff. Also, on 18th (Thursday) during the stay, at Third Thursday Lecture that is held by SISJAC on the third Thursday of each month, Tanaka gave a lecture titled “The Portrait, Painted in 1916,” talking on the portrait of Ryusei KISHIDA. 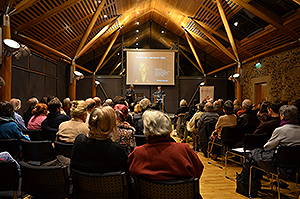 The lecture was held in the wooden lecture room that was newly built attached to the medieval cathedral, adjacent to which SISJAC is located. There was an audience of nearly one hundred and the seats were fully occupied. The audience listened to the lecture with enthusiasm, showing a great deal of interest in the modern Japanese art.